“Así como ustedes han platicado o publicado lo que vivieron, escucharon y vieron en nuestras tierras zapatistas, aquí pueden leer cómo los vimos y escuchamos quienes levantamos la bandera de la REBELDÍA ZAPATISTA”. 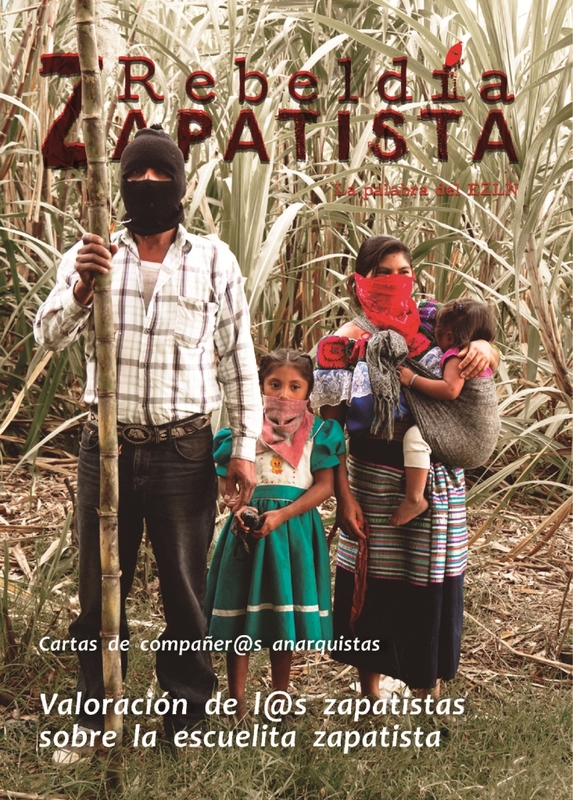 Con una editorial publicada hoy en la web de Enlace Zapatista el Subcomandante Moisés presenta el primer número de la nueva revista zapatista que lleva por título “Rebeldía Zapatista. La palabra del EZLN”. Son 27 textos los que aparercen compilados en este primer número incluyendo la valoración de los y las zapatistas sobre la Escuelita que el pasado mes de enero cumplió con tres ediciones. Además de la palabra y las reflexiones de los guardianes y guardianas (votanes), , maestros y maestras zapatistas de distintos caracoles sobre los alumnos que llegaron de todo el mundo para asistir a la Escuelita encontramos también compiladas algunas cartas anónimas y de colectivos anarquistas que participaron de la primera vuelta del curso “La libertad según los y las zapatistas”. We rebellious Zapatistas, along with our mother earth, are threatened with destruction in our Mexican homeland. Both above and below the earth’s surface, the bad governments and bad rich people, all neoliberal capitalists, want to commodify everything they see. They want to own everything. They are destructive, they are murderers, criminals, rapists. They are cruel and inhuman, they torture and disappear people, and they are corrupt. They are every bad thing you can imagine, they do not care about humanity. They are, in fact, inhuman. They are few, but they decide everything about how they will dominate countries that let themselves be dominated. They have made underdeveloped countries into their plantations, and made the underdeveloped capitalist so-called governments of those countries into their overseers. This is what has happened in Mexico. The neoliberal transnational corporations are the bosses, their plantation is called Mexico, the current overseer is named Enrique Peña Nieto, the administrators are Manuel Velasco in Chiapas and the other so-called state governors, and the badly named municipal “presidents” are the foremen. This is why we rose up against this system at dawn on January 1, 1994. For 30 years we have been constructing what we think is a better way to live, and what we have built is available for the people of Mexico and of the world to see. It is humble but healthily determined by tens of thousands of men and women who decide together how we want to autonomously govern ourselves. Nothing hides what we do, what we want, what we seek; it is all visible. The bad government on the other hand, that is, the three bad powers-that-be and the capitalist system, does everything behind the people’s back. We are sharing our humble idea of the new world that we imagine and desire with compañeros and compañeras from Mexico and all over the world. That is why we decided to have the Zapatista Little School. The Little School is about freedom and the construction of a new world different from that of the neoliberal capitalists. In addition, it is the people themselves, that is, the bases of support, who are sharing these ideas, not just their representatives. These people, not their representatives, are the ones who will say if they are doing well or if the way that they are organized is working well. That way others can see if things are really like the people’s representatives say they are. This great “sharing” between all of us, compañeros from the city and the countryside, is necessary because we are the ones who must think about how the world we want should be. It can’t just be our representatives or leaders who think about and decide how that world should be, and they certainly can’t be the ones who say how we are doing as an organization. It is the people, the base, who must speak to this. You can tell us if this has helped those who attended. As you will read in the writings in this edition of our magazine REBELDÍA ZAPATISTA, this process has helped the compañeros and compañeras who are bases of support to meet good people from other parts of Mexico and all over the world. This is important because in Mexico there is no government that recognizes the indigenous people in this country. The government only remembers them come election time, as if they were electoral paraphernalia. It is only through organization and struggle that the bases of support have defended themselves for 30 years now. The bases of support have done everything possible, and everything that seemed impossible, over these 30 years and this is what they are sharing. We worked to create the Little School so that the words of the compañeras and compañeros who are Zapatista bases of support could reach much further. With the Little School, their voices carry thousands and thousands of kilometers, not like our bullets on January 1, 1994, that only went 50 meters, or 100 meters, and maybe some 300 or 400 meters. The teachings of the Little School cross oceans, borders, and skies to reach you, compañeras, compañeros. We rebellious indigenous know that there are other indigenous rebellions that also know what neoliberal capitalism is about. There are also rebellious brothers and sisters who are not indigenous but who write to share in this edition what they think and how they view this system that is destroying planet earth. That is why we include the words of our anarchist compañeras and compañeros in this edition of the magazine. Well, compañeros of the Sixth, it is good that those who came saw with their own eyes and heard with their own ears what is happening here, and they left ready and willing to communicate this to those who couldn’t come. In this first edition of the magazine we will begin to share some of the words and ideas of our compañeras and compañeros who are Zapatista bases of support, families, guardians and guardianas, and teachers, about how they viewed the students at the Little School. Throughout the first editions of our publication we will share the evaluations made by the Little School teachers, votanes, families, and coordinators from the zones of the five caracoles. Just as you have talked about or published what you lived, heard, and saw in our Zapatista territory, here you can read how we saw and heard those who came and raised the flag of ZAPATISTA REBELLION. Mexico, January 2014, 20 years since the beginning of the war against oblivion. #Brasil “La democratización de los medios de comunicación debe ser una prioridad para la agenda de los movimientos sociales, porque no se puede tener un país verdaderamente democrático en el que la producción y transmisión de la información está sólo en manos de algunos pocos, sobre todo cuando dichos medios de comunicación (radios y TVs) son concesiones públicas. “A democratização dos meios de comunicação deve ser uma pauta prioritária para os movimentos sociais, pois não se pode ter um país realmente democrático onde só alguns usam detém a produção e transmissão da informação, ainda mais quando as principais categorias desses meios de comunicação, como TVs e rádios, são concessões públicas.